These proceedings contain 137 contributions from a conference held in Sagamihara, Japan in December 2007, which was attended by over 136 participants from 16 countries. The goal of the conference was to discuss many aspects of the upcoming VSOP-2 mission, a next generation radio Space-VLBI project with a resolution of 38 microseconds at 43 Ghz. 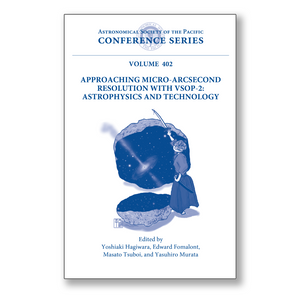 The volume contains articles related to Space-VLBI, a VSOP-2 technical overview, the scientific results from VSOP-1, and goals for VSOP-2 in galactic, extragalactic, and astrometric research. More specific topics include accretion disks around super massive black holes in AGN, the regions of relativistic jet formation and collimation, the magnetospheres around protostars, and the properties and dynamical motions of cosmic masers both in stars and active galaxies. The observing strategies and science targets of VSOP-2, Space-VLBI-related technologies, operational issues, and international collaborations are also included.